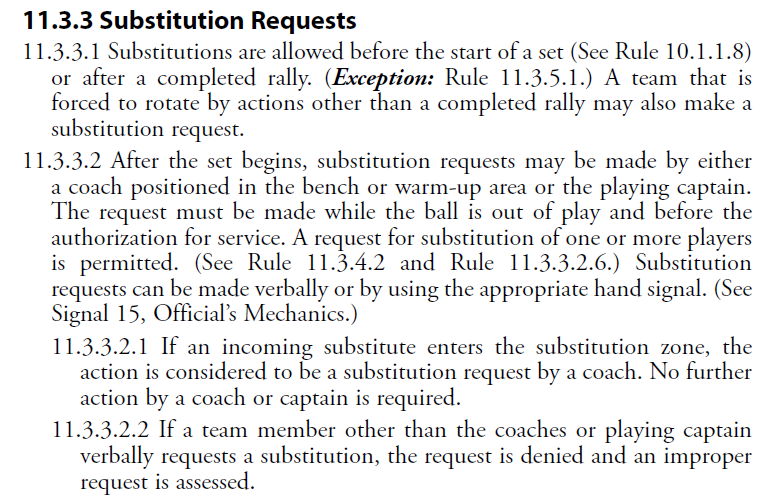 Volleyball substitution rules vary among different organizations. 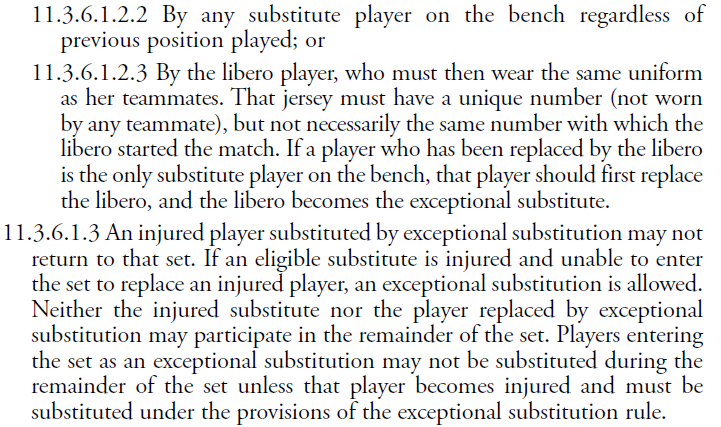 Perhaps the biggest difference is the total number of substitutions allowed per set. 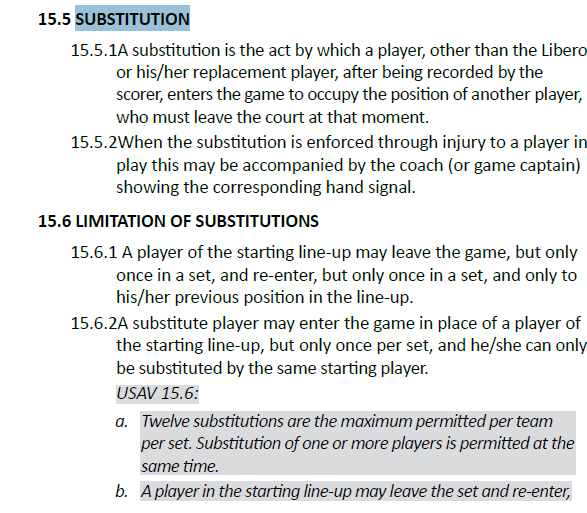 For example, in USAV, a max of 12 substitutions is allowed per set. 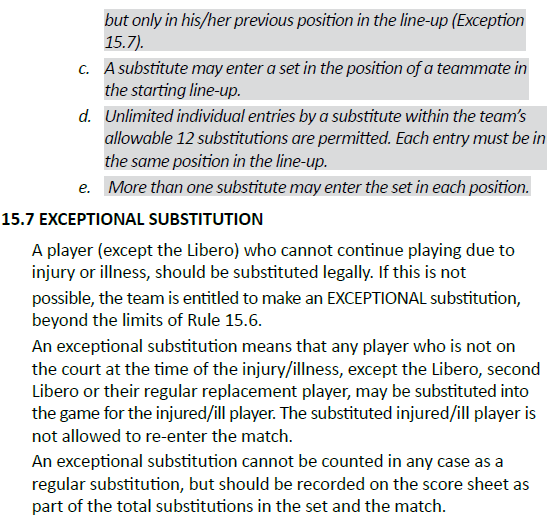 If 12 substitutions have been used and there is an injured player, the team may take an exceptional substitution. 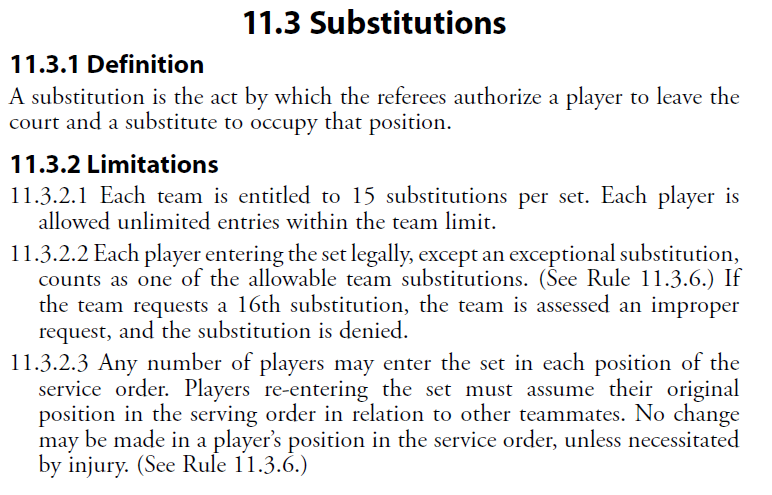 In NCAA, there is a max of 15 substitutions allowed per set. 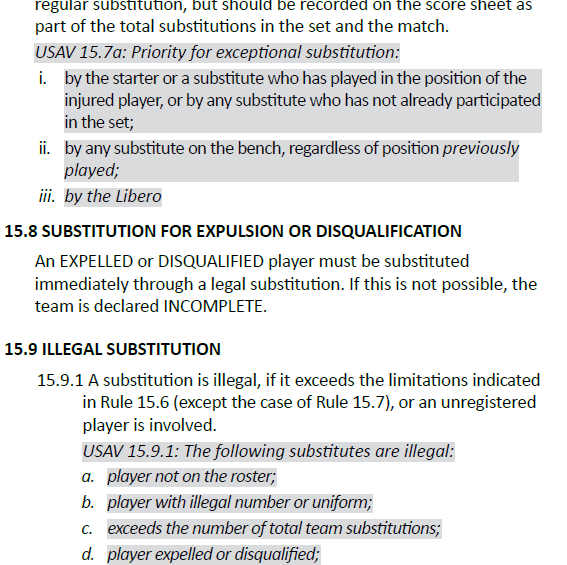 In National Federation, the max number of substitutions per set is 18. 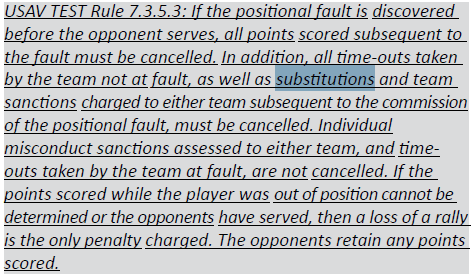 Another difference is that in NCAA, the substitution can be verbally requested by a designated coach or the playing captain. 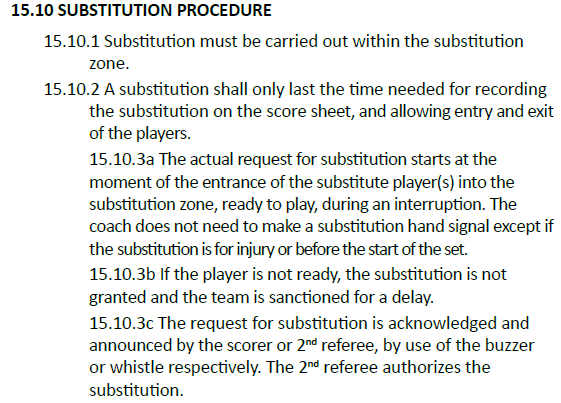 A substitute entering the substitution zone also constitutes a request. For National Federation, it's the same... coach can verbally request and also the sub entering the sub zone is a request. 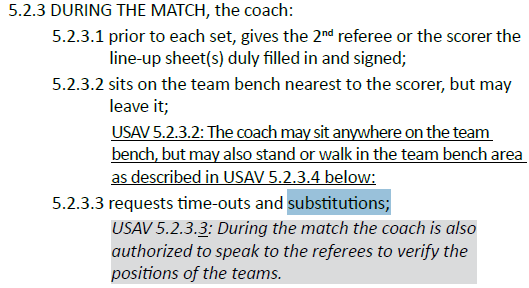 However, for USAV, the substitution is initiated by the entrance of the substitute player into the substitution zone, ready to play. Also, the coach/captain may verbally request in the case of an exceptional substitution. 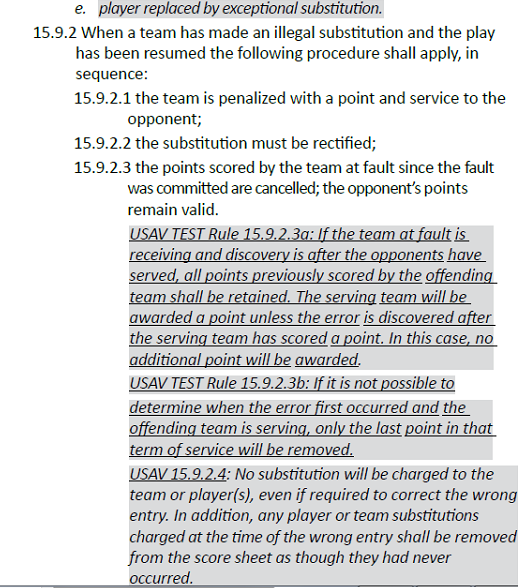 For NCAA, the scorer should notify the second referee of the 12th, 13th, 14th, and 15th substitutions. 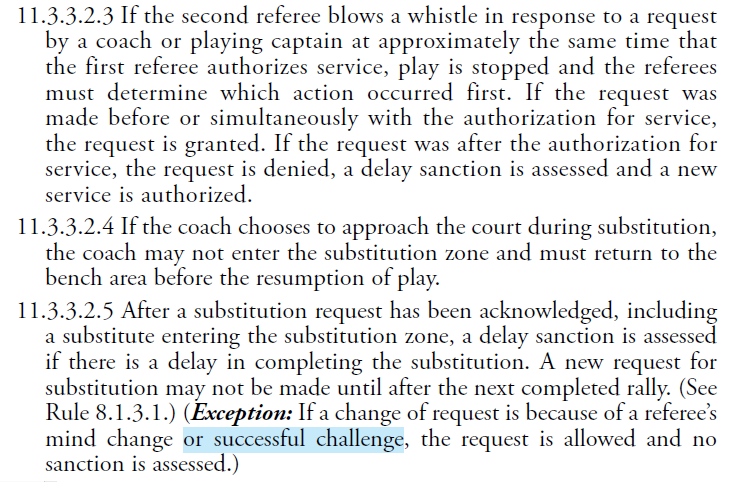 The second referee then communicates this information to a team coach. For National Federation, the scorekeeper notifies the R2 of the 15th, 16th, 17th, and 18th substitutions. The R2 then relays this information to the teams head coach. 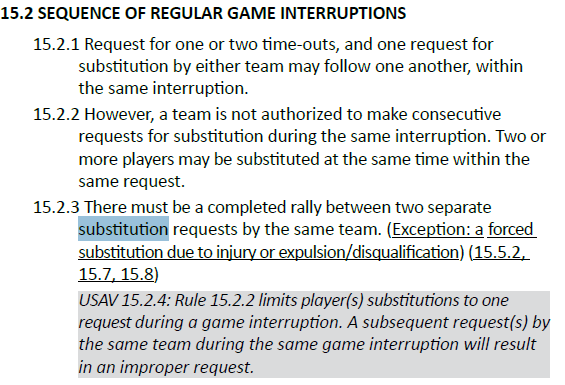 Virtually all organizations have rules for exceptional substitutions. The substitution zone is defined by the area from the 3 meter line (10 foot line off the net) to the court endline (base line). The coach or any other team personnel can't enter front zone at any time during the match. The front zone is the area from the 3 meter line to the center line. During the match, the coach can only interact with the second referee (R2) not the R1 and not any of the work crew positioned at the scorers table. If the coach has a question or request, the coach should speak to the R2 or have the floor captain speak to the first referee (R1). The libero is specialized defensive player that replaces players on the back row. The libero can only play across the back row. The libero replacements aren't substitutions. 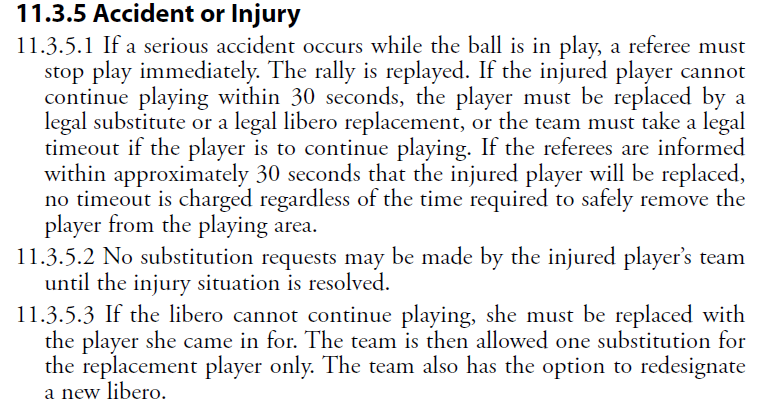 The player that the libero replaces must be the same player that comes back into the set to replace the libero. The big difference with high school volleyball is an assistant coach can request substitutions, timeouts etc. 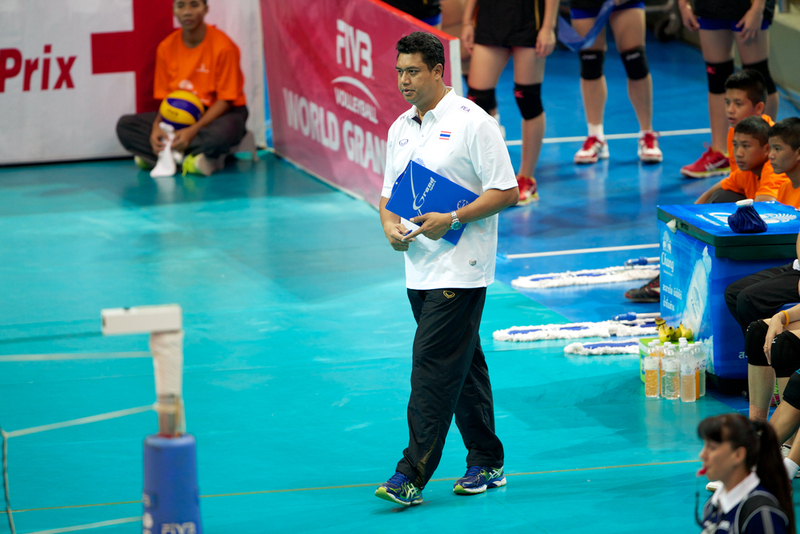 In USAV, it's only the head coach or captain that can request a substitution.